Mandu guk is a simple, yet very satisfying soup. The literal translation is dumpling soup, a meal typically eaten in the fall and winter. The hearty, non-spicy broth is usually beef based in which the dumplings are boiled, along with green onions, garlic, kelp and sometimes anchovies. This soup often comes garnished with egg and dried seaweed. Tteok mandu guk, or rice cake and dumpling soup, is traditionally enjoyed by Koreans on Lunar New Year’s Day. This version of soup includes slices of rice cake in addition to the dumplings. The whiteness of the broth symbolizes purity and the tteok, shaped like old currency, represents a prosperous year. Maturity also comes into play since Koreans turn another year older on New Year’s Day rather than their birthday. 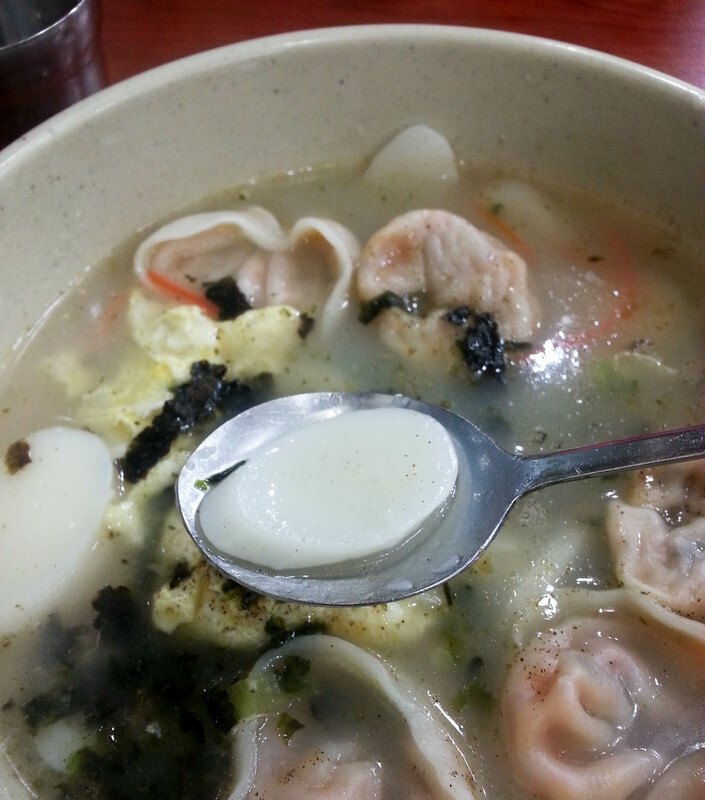 It is said that you won’t become a year older until you’ve consumed your tteok mandu guk. Maybe I’ll skip the soup this year and be 30 again. 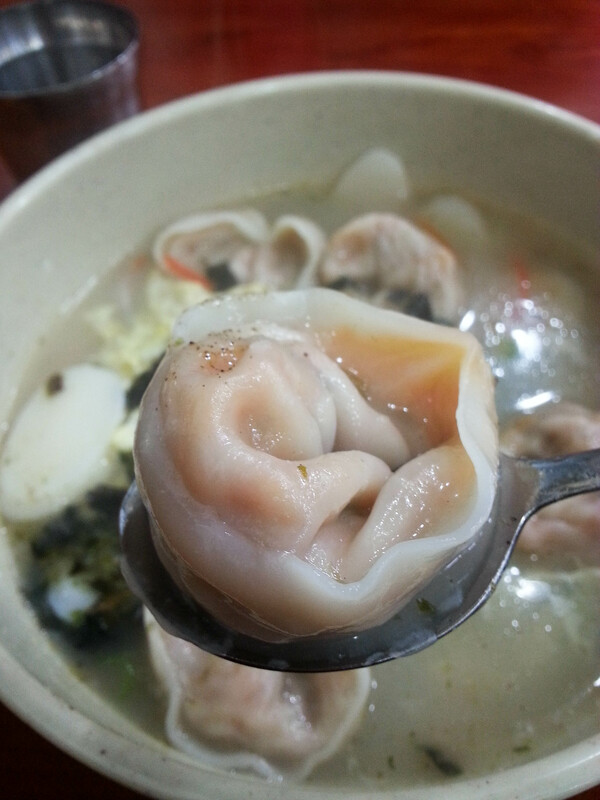 Mandu (Korean dumplings) are not just found in this soup, they are frequently eaten on their own as a snack, appetizer or side dish. More often than not I see them steamed, but they can also be served pan fried or deep fried with a side of soy sauce for dipping. So far I’ve only seen two kinds of mandu—gogi (meat, usually pork) mandu and kimchi mandu. Both kinds usually include minced onions, mung bean sprouts, garlic, ginger, and sometimes glass noodles. I still haven’t decided which one I prefer, but I do think I enjoy them best in soup. A steaming bowl of tteok mandu guk, which could easily become just mandu guk by removing the rice cakes. As usual, kimchi, radish kimchi and pickled daikon radish are served with the soup as sides. Garaetteok is a thinly sliced, disk-shaped variety of rice cake found in tteok mandu guk and tteok guk.